$350.00 Hurry, only 1 remaining! Sorry I'm Away for three months Vacation. You can Contact me for any questions. Thank you, Please come Again! This is a original 24x36 brand new oil painting on a cotton stretched canvas. Very colorful and mystical. 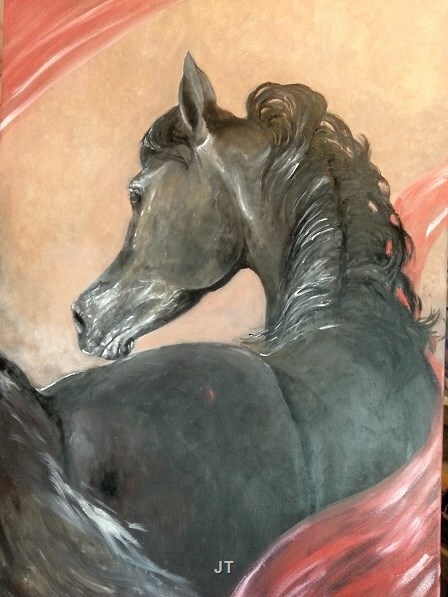 i am always inspired and love to paint horses and this one is one of my favorites. It is selling unframed and can be hung over a large mantle or any large wall if you love horses. I used professional oil paint and carefully detailed and illustrative realism. His name is inscripted on the bottom right corner. I signed and dated. Please remember to display indoors and avoid direct sunlight and extreme heat and humidity. I package safely in a card board box and ship through USPS Priority Mail.